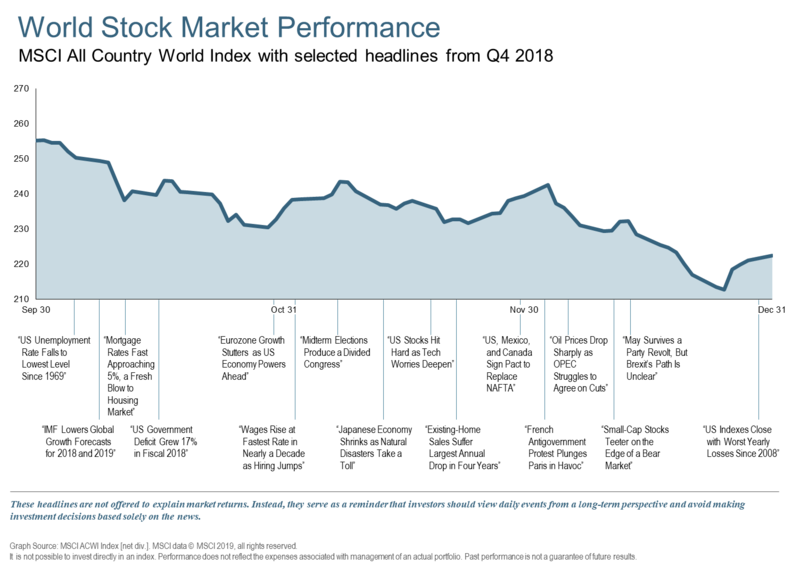 The fourth quarter was one to remember; however, instead of new index highs experienced in recent years, global equity returns finished the year negative for the second time since 2008 and intraday point swings (volatility) set new records. In late December, the Dow Jones Industrial Average fell more than 800 points in a single day, and stocks briefly entered a bear market. Subsequently, the Dow climbed over 1,000 points, which is the largest daily point gain in history and the highest daily percentage gain in almost 10 years. Yet, the annual total return for the S&P 500 ended negatively as shown below, while international and emerging markets slid in tandem. The continued revaluing of markets began to embrace a slower growth and a potential recessionary outlook for global markets. The catalysts for concern included: an ongoing trade dispute with China, unresolved Brexit negotiations, forecasted rate increases by the U.S. Federal Reserve, plummeting oil prices and the fading positive effects from the tax cuts instituted at the beginning of the year. The swift change in perception perplexed many who pointed to continued positive but slower earnings growth, robust employment numbers, strong consumer confidence readings, low inflation and relatively low interest rates. U.S. bond markets increased as the U.S. Federal Reserve raised rates .25% in December, targeting the short-term (Federal Funds) rate to a range of 2.25% to 2.50%. The overall yield curve began to anticipate slower growth for the U.S. economy with the difference between short- and long-term rates narrowing again. The 10-year Treasury yield ended 2018 at 2.73%, from a previous high set in September of 3.23%, while the 2-year Treasury yield peaked in the fall at around 2.9% and declined by year-end to approximately 2.5%. In addition to reflecting a slower growing economy, prices were driven up and yields moved lower amid the equity sell-off as investors sought a safe haven investment. 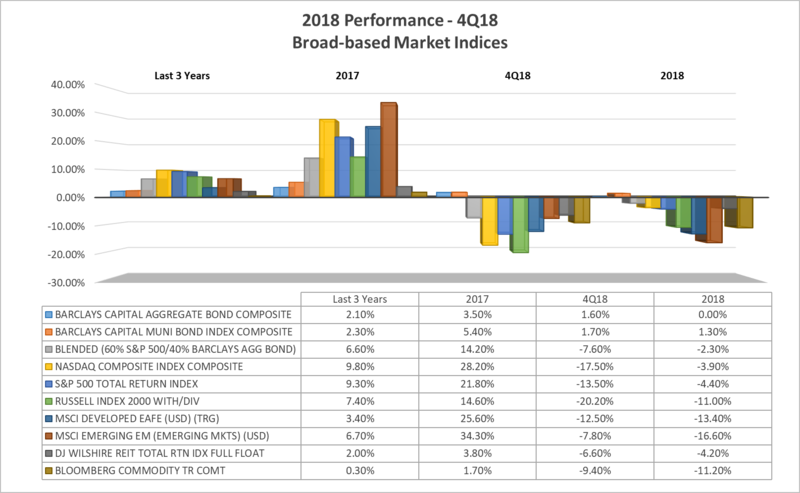 Riskier sectors of the bond market including high-yield, emerging market, and preferreds rose in yield and declined in price as participants commanded a higher return for an increasingly challenging growth environment. Alternative income securities also declined for the quarter. Oil prices plummeted in November over uncertainty about weaker global demand, increased production from the U.S. and OPEC, and unexpected waivers by the U.S. on imports to other countries from Iran. Infrastructure themes and commodities were mixed in reaction to a potential global slow-down and pending tariff arrangements with China. Given the bleak Q4 2018 markets, it is important to remember that the S&P 500 has gained 36% over the past 5 years and has nearly tripled during the last decade. As we turn the page into the New Year, equity markets have shaken off the growth scare or non-recession bear market as described above. This corresponds to Federal Reserve Chairman Jerome Powell’s recent remarks that the Fed will be “patient and flexible” with future rate hikes, providing relief that their policies are not on auto-pilot. Also, a positive December job report reinforced the current strength of the consumer. Most experts have a predicted a low probability of recession this year but agree that a late-cycle phase of the economic expansion has taken hold and could last anywhere from a short period of time to several years. Volatility experienced in 2018 will continue and is reverting to similar historical average numbers experienced prior to the quantitative easing policies in place after the 2008 Financial Crisis. Trade negotiations will be watched closely as the March 1st, 2019 deadline approaches for deliverables. European elections, Brexit negotiations, corporate earnings releases, inflation surprises as well as future interest increases by the Fed will also be in focus as the markets adjust to future growth potential. Although we continue to comment about quarterly occurrences in the markets to keep you informed, we still adhere to a long-term view for investing and want to reinforce that it’s impossible to time when negative changes will take hold and/or how long they will endure. A diversified and rebalanced asset allocation strategy is the best way to approach fulfilling your financial goals. We welcome conversations about your portfolio and family plans for 2019 and look forward to guiding you in the future markets.